Unfortunately, I won't be at Games Day USA this year... which is next weekend to see the armies in person. I truly wish I could, but it's not in the cards for me. I suspect the armies will be absolutely gorgeous in person and will be a sight to see. I'm jealous of those who are going. Please take lots of pictures and post them so that I may live vicariously through your photos and stories. You can also email them to me and rub it in even more. I'm just kidding. As we (meaning me as a small contributor) wrap up the Heroes of Armageddon project this weekend, I'd like to point folks at a couple posts already up about the project by some of the guys coordinating the whole thing. Santa Cruz Warhammer has this about the why behind the whole project. Dave Taylor has this post about the main characters in each army. The Heroes of Armageddon blog has all four armies on display now. 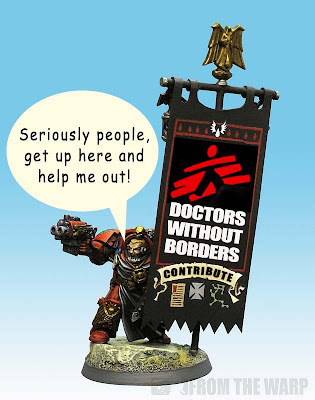 This is the last weekend to help us with the project and make a huge difference for Doctors Without Borders. Not to mention you could win a super killer army for helping out. Next year, I'm not getting involved at all. I'm going to start saving my money now so that I can pitch in as much as possible and get me one of these. I just decided that. You all better hope they do more than one army next year otherwise nobody else is going to win. This is the last weekend to get in on this project. In fact, I think Saturday night is the last night. After that, you'll have to wait until next year. Contribute... if not for the armies, then for the real reason we're all doing this. Thank you everyone and I hope to see how it all turns out next weekend. Ron- since you seem to have gotten mixed up about next years project, I am providing you with this simple and easy to understand outline. 1. You are painting something next year. 2. Therefore you can not win. 3. You will be at Games Day 2012 to bask in the glory. 4. Before you reply that you actually are not painting something, please refer to #1 above. DO you readers see what it's like! Next time you think it's all roses and good times participating in a project like this, think again... management is tough these days. You do not volunteer for this service, it is compulsory. Your skill set directly determines your placement for service, you are lucky I don't know if you are good at cleaning up poop. Besides it might be in LA next year and that's close enough for me to drive, so SCW will have a club table and its gonna be off the hook. Also there is lots of fun stuff to do with the Family in the area, so start saving up...but for the flight. I hear that Airtran has decent rates, but what ever you do, don't get a layover in Atlanta or you may never make it. The goon squad has been dispatched to From the Warp Headquarters. The Emperor demands your participation. If you are not in the project, what will my banner entry for next years gamesday be? You people don't scare me! If it's in LA next year, it may become a family vacation then. I kid though, I am good at banners but no good at shoveling... anything. Sorry to hear you won't be at Games Day this year. I would have liked a chance to meet, "the Ron". SC Mike: Sounds like a plan, I'll start passing it around here. If we get it going on both ends of the USA, we can track it's progress by way of blogs until we've got the States covered.